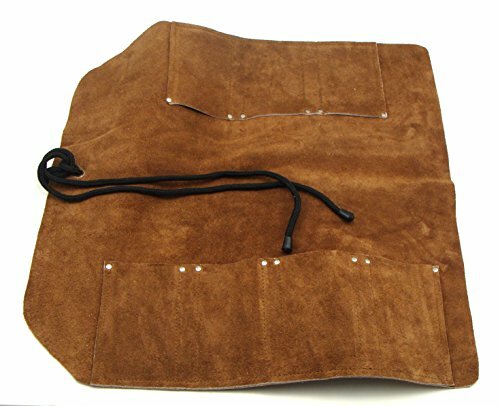 This 12 Pocket tool roll is made from top quality split grain suede leather and measures 18" X 18" (meaning it will cover tools up to 18" long). Your tools will be well protected with this roll which is designed with pockets large enough to accommodate the tool handles as opposed to the blades. The offset pockets have reinforcing rivets and measure approximately 4" x 3". For a tool handle to fit comfortably in these pockets, the handle diameter should not exceed 1-5/8". The pockets will accept the handles of most larger wood chisels and woodcarving tools as well as most large screwdrivers, wrenches, etc. The tool roll comes with a sturdy paracord lace and brass grommet for a neat and secure roll up. Paracord Lace and Grommet for a Neat and Secure Roll Up. If you have any questions about this product by Valkyrie Toolworks, contact us by completing and submitting the form below. If you are looking for a specif part number, please include it with your message.